different bullets - groups in different locations? I have shot about 400 rounds of each of this and an settled in but there is something very strange. With the 200 grain bullets, my group is 1/2" left of center and with the 185 grain bullets, by center is 1/2" right of center. I have tried a bunch of different tests and checks to make sure it wasn't something I was doing to cause this and today's efforts confirmed it. When I say 1/2" it could actually be 3/4" and this is at 25 yards. The only thing I can think of that would cause a left-right shift of groups would be how my wrist breaks during the shot. I will admit that since up-ing the load from 3.4 grains to 3.9 grains, my wrist has been hurting a LOT more. While I do believe the recoil is a bit less with the 185 grain bullets, I really didn't think it was that much different. Now I could see a change in the group locations vertically, but other than wrist-break, I can't think of anything else that would cause the shift in groups. Anyone else had a similar condition at some point? Re: different bullets - groups in different locations? Maybe the Less mass in the 185gr bullets makes it show more spin-drift? Chris you are shooting dissimilar bullets and expecting similar results? And are the 185gr at 3.0 or 4.0 of Bullseye? What distance are you shooting these at? I can tell you that the 185 SWCHP will give you less felt recoil when loaded with the same charge as a 200. I have noticed this myself and like the 185's for 50' and 25 yards for quicker recovery to target. The bullet is long gone from the barrel before your wrist breaks, many people have argued this but from what I have seen in photos and video that bullet is gone. I speak of this only with the 45 ACP as that is the only evidence I have seen. Correction was made to the O.P., it is 3.9 grains of B.E. for both bullets. 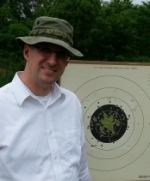 The shooting is all done at 25 yards, on the same day, with the same gun. I would certainly expect the same left-right, zero point between the loads. Its never the same with different bullets, want even more of a difference, load a 185 fmj-hp like a nosler compared with lead. The guys shooting top scores shoot all the same bullet at 50 and 25. Some reduce the powder slightly for 25 some dont. Heck, I can move the sand bagged group just by regripping my hand. Same everything else. Yes changing any one thing in your load can move the group. Or not. At least you are recognizing groups. same number back to the left when I switched back to my regular load. Chris_D wrote: Correction was made to the O.P., it is 3.9 grains of B.E. for both bullets.